InfoLogic has come up with a new upgrade for their program called MathMagic Pro 8.5. 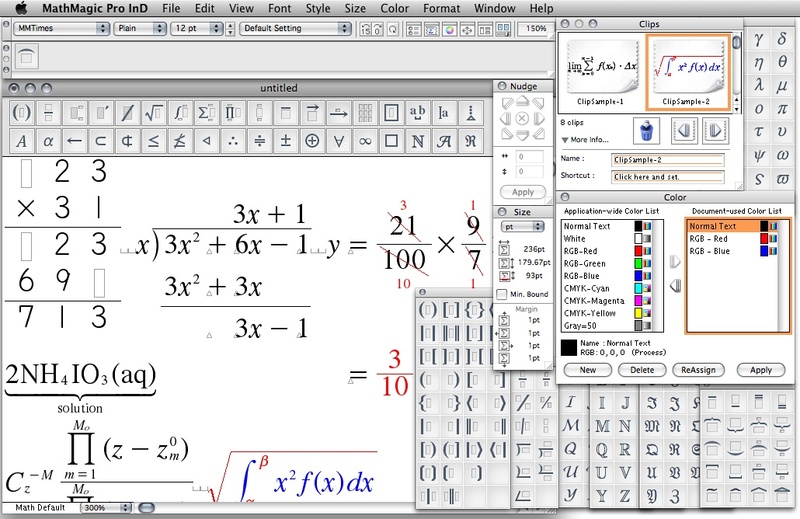 Designed for Adobe's InDesign, this award-winning equation editor for Mac OS X is a standalone multi-purpose equation editor for mathematical equations and scientific symbols. It also comes with InDesign Plug-ins to let InDesign use MathMagic as an equation editor within InDesign. Version 8.5 adds new Symbol fonts, direct drawing option for vertical and horizontal Fences, new Plug-ins for InDesign CS5~CS6 for batch applying of StyleSets, and more. Vancouver, Canada - Vancouver based InfoLogic, Inc. today announces MathMagic Pro 8.5 for Adobe InDesign, their award-winning mathematical equation editor for publishers, designers, and technical writers. MathMagic Pro is a multi-purpose equation editor which works with wide range of apps and documents such as InDesign, InCopy, Illustrator, Photoshop, Keynote, Pages, iBooks Author, and web editors. This version adds support for direct drawing of vertical and horizontal Fences for fine control over the Fence shape and thickness which is useful for very tall or wide Fences, various Frame types with corner decoration options, includes new Symbol fonts, more Sigma shapes, and more. v8.5 also comes with new Plug-ins for InDesign CS5, CS5.5 and CS6 to enable batch applying of StyleSets to multiple equations right within InDesign documents. User can apply a new StyleSet to one or more equations with an option to specify the scope, such as drag-selected area, equations in the current Text Box, equations in the current page or in the whole document. This feature dramatically improves the productivity when it is necessary to change a font, font size, spacing or equation shape for hundreds of equations placed in InDesign documents. InfoLogic also introduces a new MathML converter solution to convert equations linked or embedded in XML/HTML files into MathML. This solution is available for further customization for several XML based workflows. MathMagic Pro for InDesign comes with Plug-ins for Adobe InDesign CS ~ CS6 to enable the ability to create and edit equations right inside your InDesign document. Equations are placed in EPS format for high quality printing and PDF conversion. Automatic baseline alignment of inline equations and easy double-click re-editing are just a few of the features. MathMagic Pro works as a stand-alone application so those equations written in MathMagic can be used by wide range of applications by drag and drop or copy and paste. MathMagic reads and writes various industry standard equation formats, such as MathML, LaTeX, Plain TeX, MathJax, ASCIIMath, MathType, Wiki equation, Microsoft Word Equation, or files saved in PDF, EPS, PICT, PNG, JPEG, GIF, BMP by MathMagic or MathType. MathMagic reads mathematical expressions and symbols aloud via Text-To-Speech so it is also widely used for special education. The superior equation quality and productivity of MathMagic have been selected by publishers and technical writers around the world for their publications and digital contents. Professors, students, scientists, engineers, and school districts rely on MathMagic for their daily math communication and education. Vancouver, Canada - Founded in 1996, InfoLogic Inc. specializes in technical and desktop publishing (DTP), high quality digital contents, and Macintosh software development. Released in 1998, MathMagic is its flagship product. Copyright 1996-2013 InfoLogic, Inc. All Rights Reserved. MathMagic, MathMagic Pro Edition, MathMagic Personal Edition, MathMagic Prime Edition, MathMagic Lite, MathMagic logo, and InfoLogic are trademarks or registered trademarks of InfoLogic, Inc. Other trademarks and registered trademarks may be the property of their respective owners. All other trademarks and trade names are the property of their respective owners.